I’m always scouring the Internet for interesting personal finance articles, but every once in a while I have enough time to actually sit down and read actual personal finance books. Fresh off two relatively long vacations, I thought I’d share the 4 books I managed to finish. I’m not putting them in any particular order since their subject matter will appeal more to some than others, but they’re all worth a look. I will add more books to this post in the future if I ever get the chance to site down and read some more! Strategies from the world’s top investors on how to protect yourself and your family and maximize profit from the inevitable crashes and corrections to come. How a few simple steps can add a decade or more of additional retirement income by discovering what your 401(k) provider doesn’t want you to know. The core four principles that most of the world’s greatest financial minds utilize so that you can maximize upside and minimize downside. Master the mindset of true wealth and experience the fulfillment you deserve today. New York Times bestselling author and legendary investment guru Ric Edelman reveals his forward-thinking guide on how technology and science will reshape the way we save, invest, and plan for the future. Technology and science are evolving at a blistering, almost incomprehensible pace. The Human Genome Project took eleven years and $2.7 billion dollars to complete. Today, it would take two days to finish, and cost less than getting a pizza delivered. It’s estimated that forty percent of the current Fortune 500 companies will no longer exist by 2025. In 2005, half a billion devices were connected to the Internet. By 2030, that number will reach one trillion. The traditional paradigms of how we live, learn, and invest are shifting under our feet. Ric Edelman has seen the future, and he explains how smart investors can adapt and thrive in today’s changing marketplace. Using the same prophetic insight that has made him an iconic financial advisor, Edelman offers sound, practical investment advice through the lens of recent scientific and technological advancements. He illustrates how discoveries in robotics, nanotechnology, 3D printing, solar energy, biotechnology, and medicine will redefine our life expectancies, careers, and retirements. As we live and work longer, Edelman provides clear advice on how to recalibrate the way we save for college, invest during our careers, and plan for retirement. 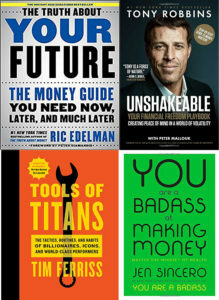 The Truth About Your Future, featuring Edelman’s proven advice and trademark humor, is a timely, must-have guide for anyone serious about successfully adapting to the ever-evolving financial landscape. ← Why I Love ETFs (And You Should Too)!